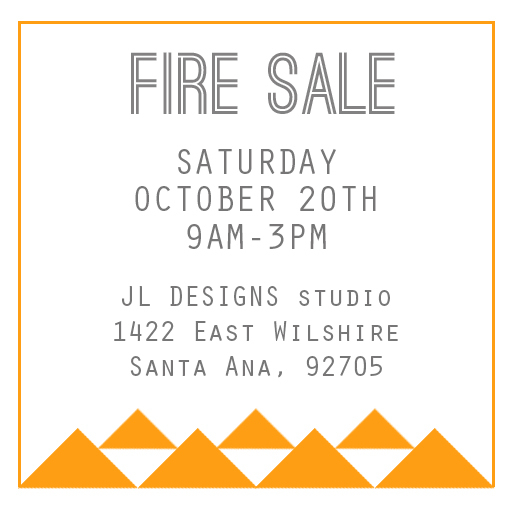 JL DESIGNS: fire sale at the JL DESIGNS studio!!! fire sale at the JL DESIGNS studio!!! so in the words of lindsey bluth "we're having a fire sale"!!! come on out this saturday, october 20 to browse our stash of goodies...some of it is stuff we only have a few of so we are trying to streamline and focus on our larger collections...some is stuff we just don't use anymore and it's hogging a lot of space! whatever the reason, we are letting it go...so if it's a good fit for you, we would love to see it find a better home rather than just collecting dust around here! hope to see you there and send you home with some fun finds! sidenote: we will be accepting CASH ONLY that day so come prepared!